Despite women’s significant contribution to agricultural production and food security in Uganda, gender issues are not well articulated in agriculture-related policies and implementation strategies. Women and girls face discrimination and inequalities in critical areas such as access to, ownership, and control of production resources such as land, credit, and extension services and this in turn diminishes their capacity to adapt to the impacts of climate change. IITA’s Edidah Ampaire highlight’s the role of women in climate change adaptation issues. A team of researchers from IITA and their partners therefore engaged parliamentarians, permanent secretaries, commissioners, and civil society organizations in a discussion on the interaction between gender, climate change, and food security. This was at a breakfast meeting with the newly elected members of the 10th Parliament on 30 August. The team led by Piet van Asten, country representative of IITA–Uganda, shared the findings of the Gender and Policy Analysis research that had analyzed various policies addressing climate change and food security in the country and had identified clear gaps in addressing the concerns of women. The study reviewed over 20 policy documents in the country from national down to district level. “Gender issues are not well articulated in most agriculture-related policies and implementation strategies. And for those that include gender issues, they lack a clear road map for implementation and implementation budgets. At district and lower levels gender integration in extension delivery is further constrained by limited skills for conducting gender analysis and articulating identified needs and opportunities,” said Edidah Ampaire, IITA delegate and coordinator for the Policy Action on Climate Change Adaptation (PACCA), a project of the CGIAR Research Program on Climate Change, Agriculture and Food Security (CCAFS) led by IITA. According to Edidah, the policies failed to pay adequate attention to structural gender constraints such as gendered power dynamics and access and ownership to important resources―women do not own land and this limits their access to credit. There was also a lack of harmonization of approaches and implementation of plans to address gender issues across the different sectors. “Gender was considered a cross-cutting issue in all the sectors which translated to it being no one’s responsibility and having no budget,” Edidah said. 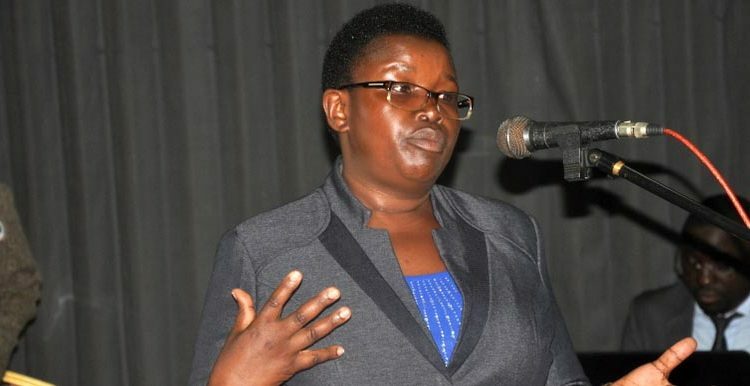 While presenting the national perspective on gender and climate change, Hon Winnie Masiko, the gender and climate change negotiator for Uganda at the The United Nations Framework Convention on Climate Change (UNFCCC), told legislators that there are no clear guidelines to incorporate gender in projects. She highlighted challenges and opportunities for mainstreaming gender in climate change such as the forthcoming climate change bill. “We need to develop a gender and climate change strategic plan,” she said. Representatives from the Ministry of Agriculture, the Ministry of Water and Environment, and the Ministry of Gender, Labor and Social Development also made presentations on the strategies they had in place to address gender issues as well as the challenges encountered in their implementation. The event enabled the new members of Parliament to understand the key issues they have to grapple with to improve the food security in the country. It was also an important step towards inclusive and integral gender discussion at the climate change adaptation and mitigation negotiations currently occurring at the Parliamentary Forum on Climate Change, including discussions on the Uganda Climate Change Bill, the Biotechnology Bill, and more generally, the preparations for the upcoming negotiations at the COP22 in Morocco. The meeting was organized by the Uganda Parliamentary Forum on Climate Change (PFCC) and Parliamentary Forum on Food Security, Population and Development (PFFSPD), in partnership with CCAFS-PACCA.